More than 60 people gathered at the Mezzanine NYC for The Alumni Society’s Catalyst New York event on Wednesday, September 26. 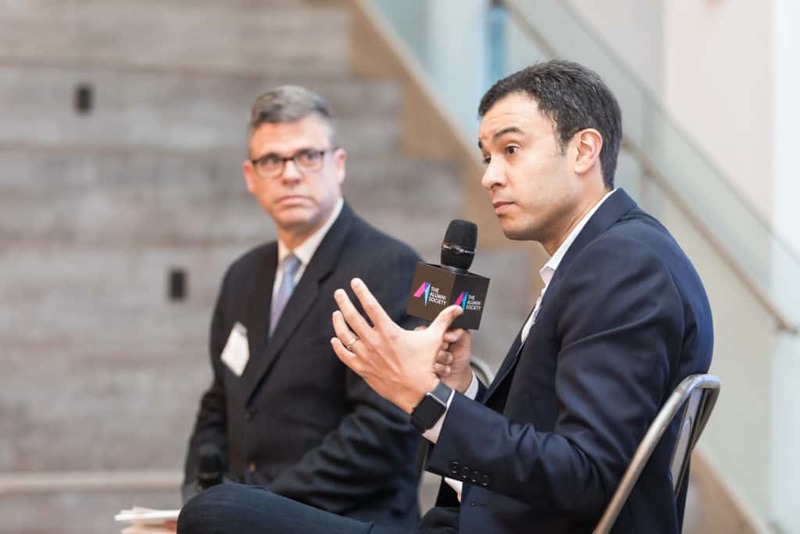 It was the second Catalyst event hosted in New York City, and this year’s event was hosted in partnership with Capital One. The night’s featured speaker was Capital One’s Kleber Santos, president of retail and direct bank. He spoke on stage with Moody’s Investors Service vice president Carlos Maymí, who is a member of the Class of 2018. 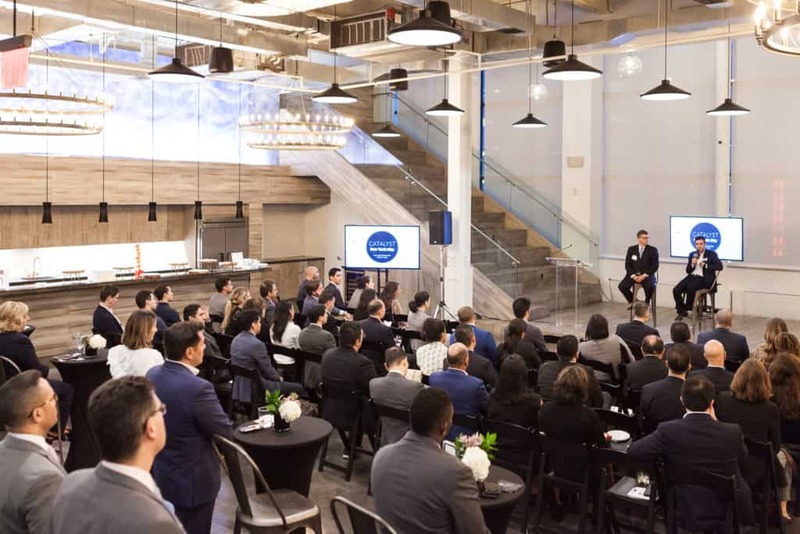 Santos shared how his military experience informed his leadership skills, his four-part leadership philosophy, his drive to serve Capital One’s customers better, and the path to increase Latino representation in executive leadership. Below are highlights from the evening’s conversation. “First and foremost, structure. Everything in the army is very structured. When you give somebody guidance, that guidance needs to be crystal clear in order to execute. I have found that when you’re managing and you have to delegate, you have to carry structure and clarity. You’re giving them the definition of a problem, with a lot of detail, and the resources available to solve the problem. It becomes easier for people to solve the problem and to grow and learn within that framework. “Number one is to recruit the very best talent. Go get the best talent where they are, and create an environment in which they feel they can entrust the next chapter of their career to you. That requires a lot of time hitting the ground and spending a lot of time not only attracting talent but also developing talent. “Number two is understand that the two things that highly talented people hate is (1) being micromanaged and (2) not having clarity. Therefore, get out of your team’s way. Leaders like to believe that they can add a lot of value; you really can’t. If you hire the right type of talent, they are a lot closer to what’s happening on the ground. You need to learn to get out of their way. “Number three is that your main role is to set the strategic direction. That you cannot outsource. You need to sell that strategy, in consultation with a lot of your team members, but then you have to declare that and be consistent. So I spend a lot of my time repeating the strategy. I want to make sure a toddler can memorize and repeat it, because it’s very simple and it’s not going to change. “I’ve always felt like I was very driven, but I have never been competitive. The language that I use is the difference between playing golf and playing tennis. When people are playing tennis, for you to win, somebody needs to lose. In golf, you see golfers constantly trying to improve their own handicap. They’re not actually competing with anyone; they are competing with themselves. I’m a lot more into the golfer mentality. “The good news in my mind is just the sheer power of the demographics will make the problem take care of itself to a certain extent. It may not be pretty, it may not be linear, but I sense that corporate America is really waking up to diversifying more broadly. The number of conversations that we have at Capital One now versus five years ago is remarkably different. I am convinced that progress will be made. It may not be as fast as we would like, but progress will be made. Photos from the event can be found on the Alumni Society Facebook page.